Eighteen more people have been diagnosed with fungal meningitis in an outbreak linked to tainted steroid injections, health officials reported today. 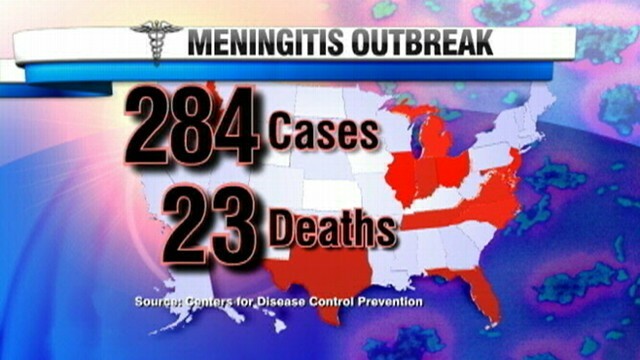 The U.S. Centers for Disease Control and Prevention increased the tally of cases to 404 in 19 states: 395 cases of fungal meningitis and nine joint infections. At least 29 people have died. The outbreak has been linked to contaminated vials of methylprednisolone acetate, an injectable steroid used to treat back and joint pain. Sealed vials of the steroid, made by the New England Compounding Center in Framingham, Mass., contained exserohilum rostratum, a fungus found in soil and plants. It's not clear how the fungus landed in the pharmacy's ostensibly sterile vials, some of which were shipped to clinics without sterility testing, according to an inspection by the Massachusetts Department of Public Health. Floor mats near sterile drug-mixing areas were "visibly soiled with assorted debris," and a leak from a nearby boiler created an "environment susceptible to contaminant growth," according to the report. Sealed vials of two other drugs made by the pharmacy contained bacteria, according to the U.S. Food and Drug Administration. The drugs were the steroid betamethasone and a cardioplegic solution that paralyzes the heart during open heart surgery. The pharmacy has recalled all of its products and shut down operations. Ameridose, a sister company of the New England Compounding Center, has also recalled all of its drugs citing sterility concerns, according to the FDA. Neither Ameridose nor the FDA have received any complaints or identified any impurities in those drugs. The longest duration from the time of injection to the onset of symptoms in the current outbreak is 42 days, according to the CDC. The tainted steroids were recalled 37 days ago. Fungal meningitis is diagnosed through a spinal tap, which draws cerebrospinal fluid from the spine that can be inspected for signs of the disease. Once detected, it can be treated with high doses of intravenous antifungal medications.